A poker player is like a salesperson working on 100 percent commission. He could go to a tournament and win money, or he could make one bad choice and be knocked out. Similarly, a salesperson can go out and close a deal or return to the office empty-handed. Every day, poker players make decisions that result in winning or losing thousands of dollars and, as seen on TV, some of those decisions can even involve millions of dollars. Leveraging specific skills to boost strategic thinking and enhance decision-making, and then putting those decisions into action, are hallmarks of high-performing poker professionals. 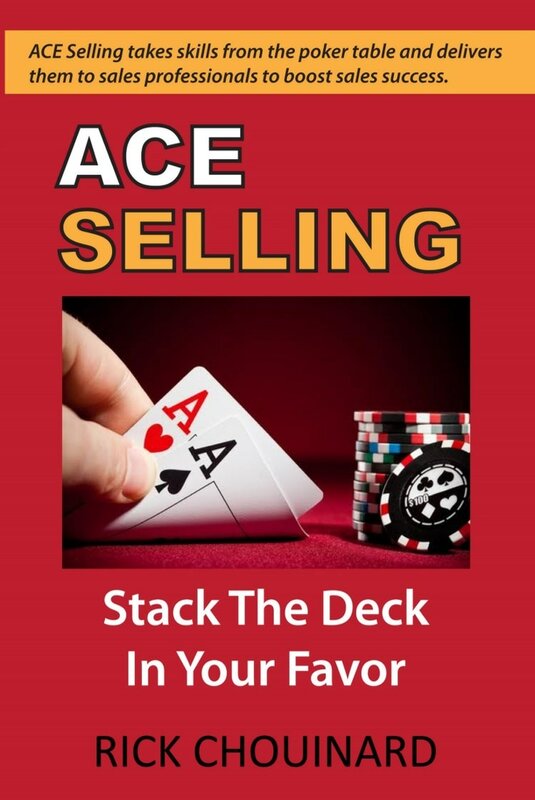 ACE Selling takes those skills from the poker table and delivers them to sales professionals to boost sales results. In poker—as with sales—there are very few guarantees, and with every poker game or sales opportunity, there can be only one winner. Therefore, in order to increase your chances of coming out on top, you need to grasp every competitive advantage. True professionals always seek to increase their edge by learning new concepts and techniques to differentiate themselves from others. In the dog-eat-dog world of selling, anything you can do to gain fresh insights and an advantage over your competitor is worth doing. By learning the skills discussed in this book, you will contribute to your competitive edge and gain another advantage in your pursuit to finish first. I have learned success in poker and sales depends on exploiting opportunities when the situation is favorable and to let go of opportunities when the reward no longer exceeds the effort or risk. In ACE Selling, we will review the fundamental skills and strategies used by world-class poker professionals to determine which course of action to take, and discuss the skills required for success when you decide to pursue the opportunity. We have all played or watched poker and understand that poker professionals make many decisions during a poker hand. They analyze a vast amount of information and a range of circumstances to arrive at the desired balance of risk and reward. The same is true for salespeople. When poker professionals decide early on to pursue a particular poker hand, they do so aware of the distinct stages of the poker process (hole cards, flop, turn, and river) that they will likely have to pass through, with each stage requiring a unique set of skills. In the same way, once the salesperson decides to pursue a sales lead, he knows there are distinct stages of the sales process (prospect, qualify, develop, and close), each requiring a unique set of skills. ACE Selling breaks the poker hand and the sales process into four unique stages. I outline specific skills used by poker professionals during these stages that salespeople can learn to use to their advantage. You’ll see these skills in action as you follow a poker and a sales scenario through each stage. For the salesperson to enjoy bigger commission checks, it is simply a matter of learning to apply these skills to their daily sales activities. Understanding these skills and knowing how and when to use them can mean the difference between success and failure. ACE Selling is the product of my twenty years of sales experience in companies ranging from Internet startups to Fortune 100 companies. I’ve spent countless hours cold calling, in face-to-face customer interactions, negotiating lengthy contracts and closing complex sales. Throughout the years, I’ve also pursued my passion for poker, which began in college when my cohorts and I would gather for so-called ‘friendly’ games. It was in college that I developed my interest in the game and from there went on to hone my skills and learn the advanced techniques I currently use when playing in poker tournaments. The idea for this book came a few years ago when I began to notice many similarities between poker and selling. At that time, I had just closed several deals within a couple of weeks, and I’d coincidentally planned to meet up with some friends in Las Vegas. Two hours after leaving Seattle’s classic rain behind, I walked past the slot machines in the Las Vegas airport, caught a cab, and arrived at the Bellagio. The Bellagio’s poker room has something to offer almost anyone: Omaha and Seven-card stud, as well as high-stakes and low-stakes tables. My poker game of choice, like that of so many others, is No-limit Texas Hold ’em. Finding a table with the right stakes, I pulled up a chair, ordered a drink, arranged my stack of poker chips and settled in for what I expected to be a few hours of fun and profit. Las Vegas, friends and poker—what more could you ask for? As the game progressed from one hand to the next, I eased into a routine. Initially, I was dealt decent cards and won a few goods hands. However, during those times when I was not playing a hand, my mind drifted back to the previous months of work, especially the past few hectic weeks full of sales-related meetings and deals that had closed. Unfortunately, my initial success at the table didn’t last long and my chip stack began to shrink. I soon found myself in the midst of a losing streak. After a couple more losing hands, I forced myself to refocus. I realized the losing streak was caused by simply not paying as much attention to the game as I did when I’d first started. This lack of focus caused me to miss the small yet important clues that make the difference between winning and losing. As I refocused—trying to replace my thoughts of past sales with the game in front of me—I realized that a poker game is strikingly similar to the sales process. Both poker and sales involve a series of events influenced by multiple people with different personalities and different agendas, all trying to manipulate the outcome. Both include only one winner per opportunity, with the rest losing out. The winners, on average, share similar skills that allow them to make better decisions than those that fall short. On the flight back to Seattle, I began to write down notes on how strategies used by successful poker professionals might be incorporated into the sales process. I wanted to write this book to share my conclusion that the key to selling is intelligent decision making, and by using advanced poker skills, salespeople can improve their decision-making abilities, resulting in increased sales performance. Throughout this book, I will revisit the importance of deciding whether to pursue an opportunity or to let it go. As a salesperson, you must constantly weigh both of these options throughout the process. Poker professionals do this all the time. My focus, however, will be to highlight those skills that can increase sales results when the decision is made to pursue a sales opportunity to its conclusion. Do I have enough information to determine a course of action? What additional information do I need to make an informed decision? How can I effectively act on that decision? ACE Selling helps answer these questions and more. It develops the comprehensive decision-making skills you need to improve the odds of winning an array of sales opportunities. In poker terms, ACE Selling takes the luck out of the draw. Awareness - to pay acute attention to detail and gathering information. Awareness is the backbone of ACE Selling. It is the foundation upon which all else rests. Competitiveness - the willingness and strong desire to succeed. Having the ability to outmaneuver your opponents puts you firmly in a winning position. Execution - the endgame. The time to deliberate is over, it’s time for action. In poker, these steps happen in quick succession (a matter of minutes), but for a salesperson, the process is drawn out over time (weeks or months). Before we dive in, let’s watch a well-played poker hand. It’s okay if you don’t understand everything in the video but, as you watch, think about the definitions of awareness, competitiveness, and execution as they apply to the hand. By the end of the book you will not only understand the intricacies of what unfolds but also how to relate it to your sales career. I am confident that ACE Selling will become a valuable resource which, in addition to your existing sales experience, will help you gain another important edge. Now buckle up for an adventure in using advanced poker strategies to improve your sales success!